William J. Beal (left) started Michigan State University’s long-term seed viability experiment in 1879. Frank Telewski (right) is its current steward. He’s surrounded by moth mulleins (Verbascum blattaria) that have germinated and bloomed during the experiment. Science is a process, requiring careful, meticulous observations and repetition of experiments to verify results and tease out patterns. All of this requires time and dedication. What can we learn when we let science take the long road? 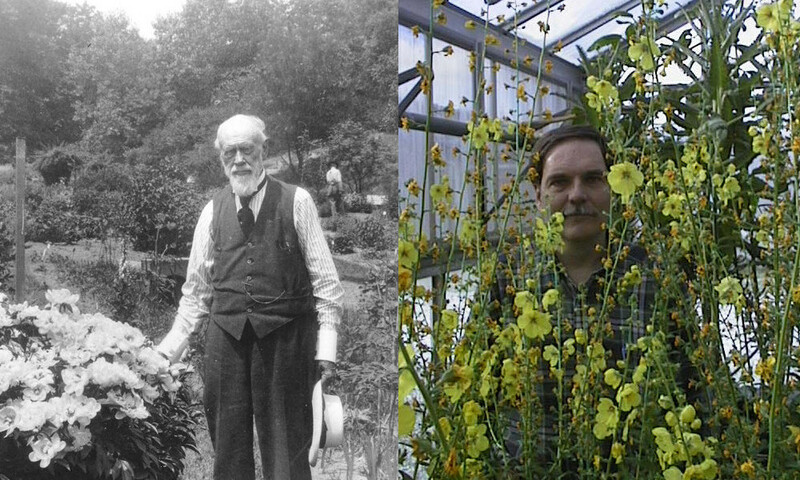 Plant biologist Frank Telewski oversees a seed viability project started by William J. Beal at Michigan State University in 1879. And Richard Lenski, an evolutionary biologist also at MSU, tracks genetic changes in 12 different populations of E. coli that have been evolving for more than 66,000 generations. They discuss what it’s like to conduct and fund experiments over long timescales in an environment of rushed publishing and on-demand results. Frank Telewski is a professor of Plant Biology and the curator of the W.J. Beal Botanical Garden at Michigan State University in East Lansing, Michigan. Richard Lenski is a professor of Microbiology and Molecular Genetics at Michigan State University in East Lansing, Michigan. IRA FLATOW: This is “Science Friday.” I’m Ira Flatow. Science, as you know, is a process– careful, meticulous observations, repeating experiments, teasing out patterns– and all of this takes time and dedication. But in this era of on-demand results and the rush to publish, research can often be designed for quick turnarounds. But this is not nature’s time scale. What can we learn when we let science take its time? Well, today we make a case for a slow science– experiments that unfold across decades, even centuries. Presented for your consideration, a study that has been going on for 140 years and another that is in its 66,000th generation. My next guests are stewards of those studies. FRANK TELEWSKI: Ira, thank you very much. RICHARD LENSKI: Yeah, thank you and Happy New Year to you. IRA FLATOW: What’s going on in East Lansing that you guys are all working on? You know each other, hang out at all? FRANK TELEWSKI: Oh, well we certainly, yes, see each other around the campus, attending seminars, lecturing. IRA FLATOW: That’s good. OK. Now let me ask you, Frank first, you oversee a seed germination project that was started, what, back in 1879? Tell us about that. FRANK TELEWSKI: Oh, that’s correct. Professor William James Beal, who came here to Michigan State in 1870, was very interested in working with farmers and addressing farmer questions and some very basic and applied botanical questions related to agriculture and plants in general. And I think one of the big questions that was of the time was I go out there and I plow up my field as a farmer. And I sow my seeds, and these pesky weeds come up. And they are growing all over the place, and I go out there with my hoe– a long row to hoe is the terminology came from that– physically removing the weeds and yanking them out. It’s a lot of work. They didn’t have herbicides back then or ways to control weeds. And all these pesky weeds, when can we expect them to start declining in population? And when can we start seeing a little bit less work in our fields? And so that was a question directly related to how long can seeds remain viable in the soil, or what we refer to as the seed bank. So Professor Beal designed this experiment to see how long different types of seeds would remain viable within the soil. IRA FLATOW: So what was the experiment? What did he actually do? FRANK TELEWSKI: Well, he started out with 20 bottles, and in those 20 bottles, he would insert a sandy mix so he had some sand on his bench there. And in the sand, he would mix in 21 species of different seeds– weed seeds and more common plant seeds. And he would count out 50 seeds of each of the particular species and mix them into the sand and fill the bottle, do that 20 times. And then they buried the bottles here upside down at a slight angle on the grounds of Michigan State University. And the intent was that every five years, excavate a bottle, shake the sandy seed mix out, and see what would germinate. IRA FLATOW: And you’ve been doing that for him? FRANK TELEWSKI: Well, I’m very honored to be able to step in his shoes, so to speak, in the year 2000 with Dr. Jan Zeevaart. We were the next generation of scientists to pick up the mantle and go out there, excavate, remove a bottle, and continue the experiment. IRA FLATOW: And in that 2000, I understand that you unearthed the bottles in the middle of the night. Was there method to that madness there? FRANK TELEWSKI: Yeah, actually there’s two reasons for that. I think the scientific– main scientific– reason is that many seeds that are buried in the seed bank receive environmental triggers to germinate. And one of the key environmental signals to germinate is light, so sunlight or any other kind of light. And so when we excavate the bottles, we end up exposing the ends of several of the bottles, and so we don’t want to unnecessarily trigger a germination event in a bottle prior to its removal. The other aspect is we don’t like to attract attention to ourselves. So working in the dark of night on campus before sun up, it’s a pretty quiet time on campus. And so DPPS, our campus police department, know we’re out there, and hopefully that’s all that knows we’re out there. IRA FLATOW: Well, I have to ask you the $64 question. Did the seeds germinate? I mean, they’ve been buried since 1879. FRANK TELEWSKI: Well, yeah. This is what’s so exciting is that we don’t know what the results are going to be until they actually start to germinate. And so within about seven days after we had taken the soil, the sandy soil, out of the bottle and spread it out onto a sterile soil mix surface in the growth chamber, we were very excited to see some little green plants begin to germinate. And we nurtured those along and found out that we had, I believe, it was 24 verbascum blattaria– the moth mullein plants– germinate, which is an amazing germination rate after being buried in the ground for 120 years. That’d be close to a 50% germination rate. And one single plant of what we call cheeses– malva rotundifolia– germinated, and so we were very excited about that. That’s a plant that has not consistently shown up in the experiment. But fortunately going back to Beal’s meticulous notes on the subject, we found out that those seeds may not have been viable when they were put in the experiment in the beginning of the study. IRA FLATOW: So you’ve read through Dr. Beal’s notebooks and his original notes. You have any sense of how Victorian science was different than how we do research today? FRANK TELEWSKI: Well, unfortunately, I don’t have his original notebooks. They were unfortunately lost in a garage fire many decades ago, but we do have his publications. And that’s what’s so important about any scientific publication in a peer reviewed journal is having access for future generations to pull that information out. And so being able to read his original words that he wrote and published is very inspiring and is very helpful because, again, going back to how the original experiment was designed and set out and implemented and what were the results he found. And Professor Beal was very meticulous as an observer. He always taught his students, be keen observers of the world around you. Keep squinting. Keep looking at those things. And he practiced what he preached. And so when he looked at these seeds coming out the bottles, when he looked at the various experiments that he did, he took meticulous notes and recorded those notes and reported those notes in the published literature. IRA FLATOW: Now let’s change the subject to something totally different. 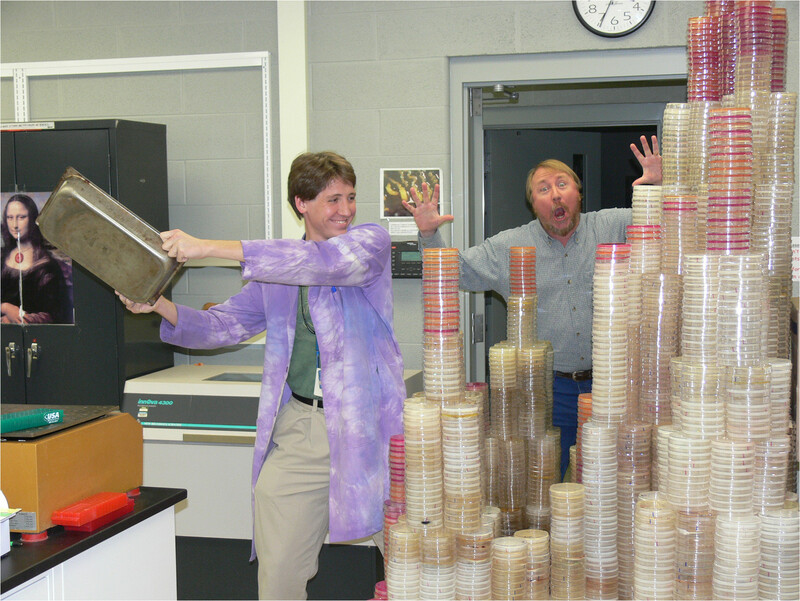 Richard Lenski, you started your project in 1988 growing colonies of E. coli. Why did you want to do this? And what’s the original question? RICHARD LENSKI: So there were several questions, but I’d say the key question that really motivated me on this experiment was I’ve just always been fascinated about the tension between luck and skill in the games we play. And in evolution, that takes the form of natural selection, which is if you have two different genotypes and one reproduces faster than the other, it should win. But genotypes arise by random mutations, and so there’s this luck of the mutations and then the competition between organisms. And I wanted to sort of ask the question if I could set up these 12 replicate populations of E. coli all started from the same ancestor, would they evolve along similar or different paths from one another? IRA FLATOW: And the answer is? RICHARD LENSKI: The answer is, it’s not a very well posed question, so the excitement in the work has been we’ve seen some really dramatic examples of similarities between the populations where they’re doing a lot of things quite similar to one another. All of the 12 populations are making cells that not only grow much faster than their ancestor, but that are much bigger cells. But we’ve also seen cases where one population goes off and does something completely different from another population. So we’re using it as an open-ended experiment to look at this tension between the reproducibility and the randomness of evolution. IRA FLATOW: You know. I’m looking in my mind and thinking of stacks and stacks of Petri dishes here or some glassware with all kinds of colonies inside. Very far off from what I’m looking at? RICHARD LENSKI: So the experiment itself is actually quite a small experiment. There are 12 little flasks that only hold a few ounces of liquid each. And every day– so our experiment is, compared to the one that Frank just told you about, our experiment’s a baby. It’s only going to have its 29th birthday next year. But unlike that experiment, we do something every day. Somebody in the lab takes 1% of each population of the bacteria and transfers it into fresh media. So every day, the bacteria have about seven doublings or seven generations of growth. Now one of the neat things– it’s a little bit like the seed bank that Frank talked about– one of the really neat things with bacteria is we can freeze them away at minus 80 degrees Celsius. So we put them in deep freezers periodically, and we now have several freezers full of samples from different periods along our experiment. And what we can do is we can do experiments where we, for example, compete the bacteria from a later generation against their very own ancestors. So one of the things we see, if your listeners take away nothing else, is we can see the Darwinian process of adaptation by natural selection. These random mutations, most of which are neutral and many of which are deleterious to the organisms, natural selection is the systematic advantage that accrues to those that are reproducing faster than other genotypes in this very simple laboratory environment that we give them. So the stacks of Petri dishes come when we do these competition experiments. We need certain ways of counting the bacteria and telling apart which ones are the ancestral bacteria, which ones are the evolved bacteria. So we have little tricks with Petri dishes and colors of colonies that will allow us to tell them apart. IRA FLATOW: Let me ask both of you, I mean, don’t you face a crisis of sort of creating a priesthood of scientists who will take over when you’re retiring to continue these experiments? RICHARD LENSKI: So I very much am– I don’t know about a priesthood, but I am very much looking forward to the possibility that my experiment might continue as long as Professor Beal’s. So as I said, it’s about a quarter as old at this point. And there are many people who would be interested in continuing the experiment. I’d like to pass it on while I’m still relatively young and able to help plan its future. And I think it’s been an experiment that’s yielded a lot of interesting results, a lot of surprises along the way, and I very much hope it can continue, really, into perpetuity. IRA FLATOW: Because you know that budgets get cut at universities. When they start to cut budgets, science budgets get cut usually the first sometime. I mean, you know, is it possible you might have to ship it off to another university, maybe in a cold climate like they have in Michigan so you don’t have to refrigerate as much? RICHARD LENSKI: Well, I think the freezers are the least of our problems, although we always worry about power outages and that kind of stuff. But you know, maybe one of your listeners has $2 or $3 million extra they’d like to share because that’s all– you know, all it needs is a small endowment, in this case, to keep the experiment going into perpetuity because the work is pretty simple, and yet the experiment, I call it the experiment that keeps on giving because it just keeps– the bacteria are creative. The students are creative. New technologies come along. So when I started the experiment, not a single bacterial genome had been sequenced. And recently, we published a paper where we sequenced hundreds of complete genomes of the E. coli bacteria out of this one experiment. So the new technologies are just making old experiments incredibly exciting. IRA FLATOW: Now Frank, you’re a researcher and also a curator. And once a scientist is gone, so is there collection. Don’t you have the same worries here? FRANK TELEWSKI: Well, that’s a really good question, and actually we have a way of dealing with that here at Michigan State University. We have what’s referred to as the Collections Council. And so the Collections Council, they’re all the curators of all the variety of collections, natural history collections and cultural collections at the University. And we provide a way of governance, a loose governance, but a way of trying to facilitate continuity between collections. And anytime that you have a collection and you have a curatorial staff or a curator involved with that collection, you have a collections policy. And that collections policy involves what to do with the collection if that collection no longer has a home at a particular institution, so what we refer to as deacessioning. And so if we have to lose a collection, it should never end up into a dumpster someplace. And we’ve actually had a few instances in the past where maybe a collection without a curator and without a faculty position being hired to fulfill that particular need, that collection is important enough, and it needs to be preserved. And so maybe it will be shipped to another institution, a sister institution. I believe we sent some fossil specimens to the Chicago Field Museum a few years ago as a way of preserving that and along with all the information. So yeah, there is always that possibility. IRA FLATOW: I have to interrupt you and let everybody know that this is “Science Friday” from PRI, Public Radio International. I’m Ira Flatow talking with Frank Telewski and Richard Lenski. I didn’t mean to interrupt you. So yeah, you’re hoping that they continue in their tradition. FRANK TELEWSKI: Yeah, and I think to kind of answer your question from the Beal seed experiment earlier about funding, one of the things that we’re very fortunate, and Rich kind of mentioned, is that the bottles sit in the soil for 20 years now. It originally was five years. It got extended to 10 years. Now we’re doing it every 20 years. We have five more bottles. So after 2020, we’ll have four more bottles. But there’s not a lot of maintenance necessary. You dig a bottle up, you analyze it, you wait 20 years. But as Rich mentioned, certainly when you think back to the time of Professor Beal, you know, they didn’t have any idea what DNA was. I don’t think DNA even was on anybody’s radar as a chemical at that point in time, let alone the genetic material, genetic information. And now that we have this information, and now that we have the advanced technologies to sequence, one of the exciting things with these old experiments is can we actually utilize modern technology– and we will use more technology– to expand our knowledge of this legacy study? And so, for instance, when we think about seeds buried in the soil, we basically have what we can refer to as a genetic reservoir. And so these are a trapped genetic reservoir from 100, well, it’ll be 140 years when we open the bottle up in 2020. How does that population vary to an existing population in Michigan today? And can we see significant changes and adaptations that maybe the populations today that have been around for 140 years have made? So bringing in new faculty– I wouldn’t call them priests. We’re doing science. It is an honor to be a part of that. I’m sure that the people who come and replace us will feel that way as well. But it is also– it’s also stewardship that’s so important to make sure that these experiments are maintaining and connectivity continuity is maintained. IRA FLATOW: Well, I wish you both luck. And if you find those few millions, maybe you can send a few our direction because we can all– we can all use the research. Just my last comment, it’s interesting also– I don’t have much time to talk about it– in this age of computer simulation, you’re actually still working hands-on with the actual materials themselves and not having computer generated models and what might happen. You get down there and look at a seed that’s 140 years old. Frank Telewski, Professor of Plant Biology and the Curator of the W.J. Beal Botanical Garden at Michigan State University in East Lansing. Richard Lenski, Professor of Microbiology, Molecular Genetics, also at Michigan State University. Happy to introduce you to one another and go have a beer on us. Genetic engineers have designed strains of E. coli that can survive only in the presence of a compound that doesn't exist in nature.